Amanda and her niece enjoy their time at the site of the nostalgic green-and-white bus wall painting at Blacksmith Road. 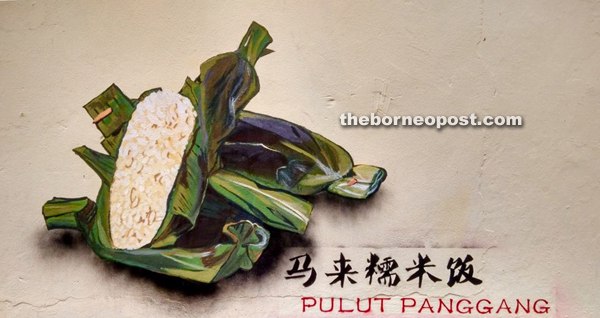 This painting depicts one of the favourite local snacks, the ‘pulut panggang’ that consists of glutinous rice soaked in coconut milk and steamed before it is rolled in banana leaves and then grilled. 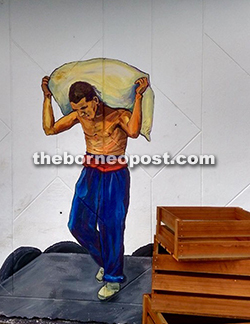 This painting of a wharf coolie adorns a wall inside the food court at Khoo Peng Loong Road. 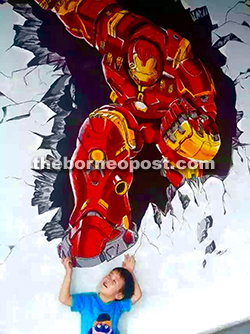 SIBU: The street art scene here will continue to flourish if the completion of an artwork adorning the wall of a side lane at Blacksmith Road is anything to go by. The wall painting, the latest of five series of mural artworks commissioned by Sibu Municipal Council (SMC), depicts an old school green-and-white bus with the words ‘Sibu Bus Station 70’s’ inscribed on its side — a symbol of the 60s and 70s when that very bus served as the town’s main public transport. 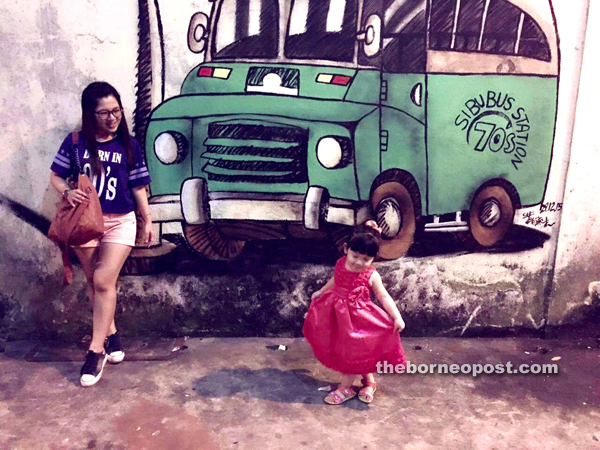 The mural drawn by a young local artist has been attracting passers-by, especially youths intrigued by the significance of the ‘old green-and-white bus’ to the older generation of this town. The artwork has become a talking point at local coffee shops where patrons share with one another their ‘encounters’ with the bus back in the old days. One patron, in particular, is heard talking about how he used to live in a village downstream and whenever he went to this town to visit his relatives at Queensway (now Tun Abang Haji Openg Road), he would hop on that very green-and-white bus after disembarking from the motor boat. According to SMC deputy chairman Dato Andrew Wong, such rich social, cultural and historical recollection is the core objective of the mural artwork project, which could become a tourism draw of this town. “The fifth mural was completed about a fortnight ago. Yes, we shall continue telling the stories of Sibu through wall paintings. Our street art committee and local artists are working together in this endeavour,” he said, adding that the collaboration included two groups of local artists. Wong said the council had specially chosen the lane at Blacksmith Road, which is just a stone’s throw away from the site of the former station of the green-and-white buses. A painting of children playing traditional games in the central market. The first mural artwork completed last May depicts a wharf coolie with a large sack on his shoulders. 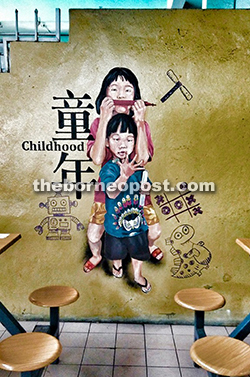 It adorns a wall inside the hawkers food centre at Khoo Peng Loong Road — the site of what used to be a bustling wharf. The second mural consists of paintings of local food along a side lane wall at Market Road, while the third painting is in the central market here, showing children playing traditional street games. The fourth inside Mara Commercial Complex comprises paintings of butterflies that symbolise the state’s rich tropical rainforests. On the mural project, Wong acknowledged the artists’ role in suggesting the themes for their artworks. He said he was touched by their commitment for their homeland, and that they volunteered their service while SMC covered the cost of the painting materials. Wong also mentioned that more public paintings would come up in view of the ‘Visit Sibu Year 2017’ campaign, and several topics would be discussed along the way. “We would also seek ways to tell (Sibu) stories through these paintings — some young folk may not totally understand the town’s history — case in point, green-and-white bus,” he said. Wong said he might propose for the provision of background or ‘concrete canvas’ for these artworks. Meanwhile, the green-and-white bus wall painting has gone viral on social media. Former journalist Amanda Ting said she was told by a friend about the artwork. The mural project initiated by SMC has inspired those from the private sector to follow suit. Photo shows Jason, son of local businessman Robert Hii in front of an elaborate artwork that adorns a wall outside Sarawak House. 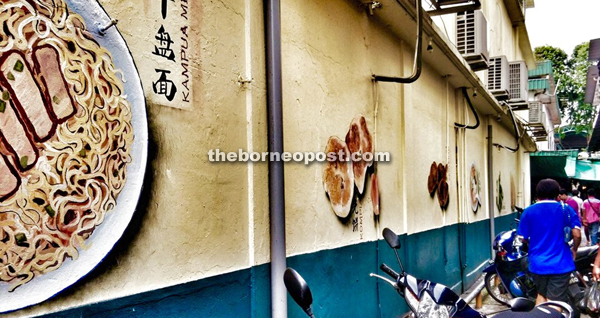 Ting said she had seen the renowned murals of Penang two years ago and was impressed by them. She encouraged SMC to continue working with local artists in ‘portraying life in Sibu’. She also hoped more mural paintings would be commissioned on the walls along the lanes of Blacksmith Road and the surrounding areas. Ting said of all mural artworks, the green-and-white bus and that of children playing traditional games are her favourites. “The bus (painting) is an attraction. I admit that I only know about the buses from the painting — that the buses were operating in Sibu about half a century ago. “We must continue telling our stories on these walls,” she added. A visual culinary extravaganza that adorns the wall along Market Road lane. 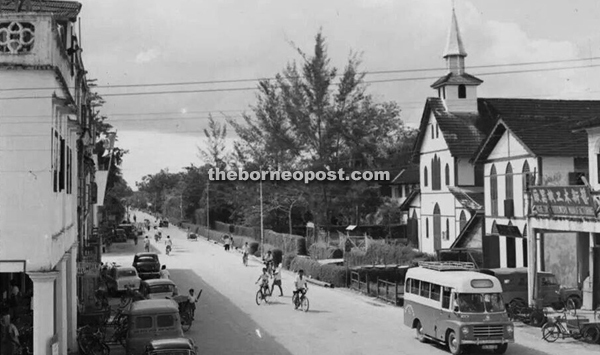 An old photograph of Sibu taken in the 60s shows the traffic along Island Road. Notice the old school green-and-white bus on the bottom right corner of the picture.